Ai - Are You Ready for the Quality Payment Program? 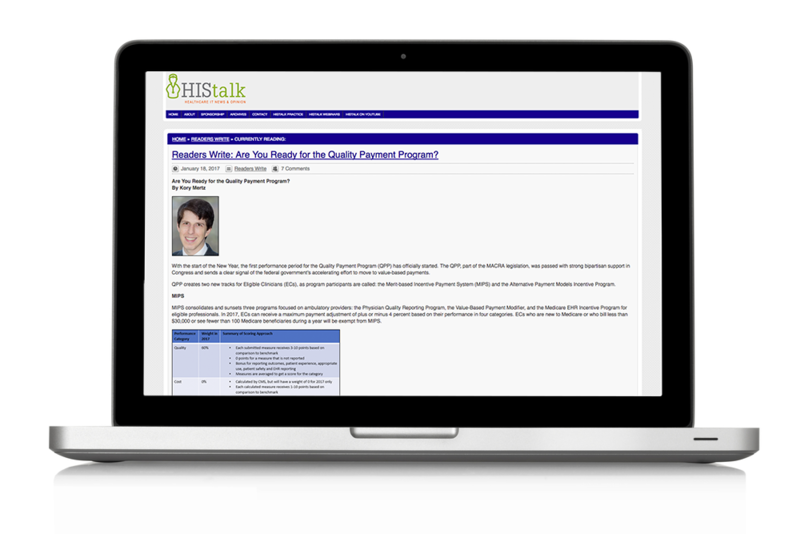 Are You Ready for the Quality Payment Program? With the start of the New Year, the first performance period for the Quality Payment Program (QPP) has officially started. The QPP, part of the MACRA legislation, was passed with strong bipartisan support in Congress and sends a clear signal of the federal government’s accelerating effort to move to value-based payments. QPP creates two new tracks for Eligible Clinicians (ECs), as program participants are called: the Merit-based Incentive Payment System (MIPS) and the Alternative Payment Models Incentive Program. MIPS consolidates and sunsets three programs focused on ambulatory providers: the Physician Quality Reporting Program, the Value-Based Payment Modifier, and the Medicare EHR Incentive Program for eligible professionals. In 2017, ECs can receive a maximum payment adjustment of plus or minus 4 percent based on their performance in four categories. ECs who are new to Medicare or who bill less than $30,000 or see fewer than 100 Medicare beneficiaries during a year will be exempt from MIPS. The second track of QPP is focused on increasing EC participation in Alternative Payment Models (APM) (i.e. Accountable Care Organizations, bundled payments, etc.) by offering a 5 percent bonus and exemption from MIPS for ECs who participate in an Advanced APM and meet certain participation thresholds. 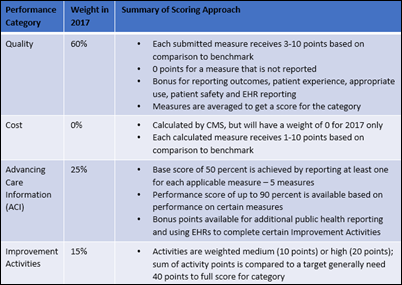 In 2017, ECs must have at least 25 percent of their Medicare payments or 20 percent of their Medicare patient panel in a CMS Advanced APM to receive the bonus and MIPS exemption. ECs who meet lower payment or patient thresholds have the option to be exempt from MIPS. CMS maintains the list of qualifying Advanced APMs here. The overarching framework created in the legislation and initial rulemaking completed by the Obama Administration will continue unchanged in 2017. The Trump Administration will have a chance to put its own twist on the QPP in 2017 by filling in the program implementation details through sub-regulatory guidance (much like CMS has done with the Meaningful Use program) and in 2018 and beyond through rulemaking to establish future program requirements. If Representative Tom Price is confirmed as the Secretary of the Department of Health and Human Services, he may accelerate efforts to reduce provider burden and simplify the QPP. As providers prepare to participate in the first year of QPP and HIOs prepare to support providers’ success, they should keep the following in mind. While APMs have gained significant attention in recent years, CMS anticipates that the vast majority of providers will participate in MIPS in the early years of the QPP. Providers just beginning to think about the QPP requirements should generate reports to determine which providers are likely to be an EC during the performance period and which will fall under the low volume exclusion; map out the existing TIN/NPI structure of the organization to help support decision making around group versus individual reporting; and undertake a scan across the organization to determine existing Advanced APM participation by ECs. If an organization participates in an Advanced APM, a report should be generated based on all participating providers to determine if participants will qualify for a bonus and MIPS exemption under the APM track. Implement certified tools to collect and submit electronic quality measures to CMS to support ECs and help them achieve bonus points for the quality performance category. Support ECs success with a variety of ACI measures including HIE (send and receive); view, download and transmit; and submitting information to public health and clinical data registries. A key consideration in determining which measures to support include the existing exchange environment the HIO operates in, if certified technology is required to meet the measure, whether the HIO’s technology meets the requirements (i.e. providing machine readable C-CDAs), and the ability to provide ECs necessary audit documentation. Support improvement activities. For example, “Ensure that there is bilateral exchange of necessary patient information to guide patient care that could include one or more of the following: Participate in a Health Information Exchange if available; and/or use structured referral notes.” A key consideration for supporting improvement activities is whether the HIO has the ability to provide ECs with necessary audit documentation. This article can also be accessed here.